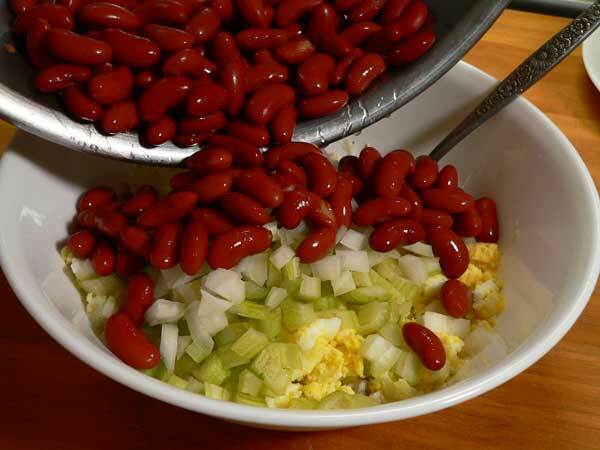 Easy to make Kidney Bean Salad recipe with complete step-by-step, photo illustrated instructions and a printable recipe. This dish is really easy. Mix it all up in one bowl. Quick and Easy Kidney Bean Salad Recipe. About a week ago, I received an email from one of the subscribers to the Taste of Southern Newsletter asking if I’d ever heard of a Kidney Bean Salad. The person asking told me it included kidney beans, onion, eggs, mayonnaise, and maybe pickle relish. She said she knew it sounded strange but she remembered it being very good. Mitzi C. says she remembers this from her youth growing up in Western Kentucky. Again, I’d never heard of it. It did sound strange, but my curiosity was piqued. I told Mitzi that I had already placed Kidney Beans on my shopping list. I wanted to try this. The recipe below is adapted from one you’ll find on the Bush’s Best Beans website. Their recipe called for dill pickles. I’m just not a fan of dill pickles. Makes my mouth pucker. When I asked Mitzi about the dill pickle relish, she said the only thing they knew as relish was a sweet pickle relish. It seems we were in agreement with that. So, sweet pickle it is. You can whip this up in just a few minutes, and all in one bowl. It’s that easy. But, it really tastes best if you can refrigerate it overnight to let the flavors fully develop. At least try to give it an hour or two in the fridge to get it cold. You’ll like it that much more. 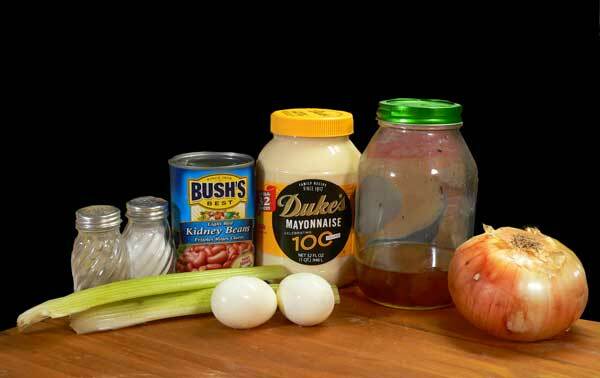 I knew when the recipe called for mayonnaise that we could make it Southern just by using our favorite Duke’s Mayonnaise. They don’t pay me to say that. Duke’s folks don’t even know me. Smile. The salad reminded me a bit of a Waldorf Salad minus the crunch of the apples. And, I do love a good Waldorf Salad. Most of all, this was a new taste experience that I will be making again. I think you will also. 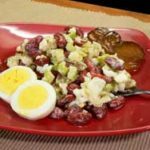 So, if you’re ready to give this Kidney Bean Salad a try, let’s head on out to the kitchen and… Let’s Get Cooking – I mean refrigerating. No cooking involved with this one. Told you it was easy. Smile. You’ll need these ingredients to make our Kidney Bean Salad recipe. 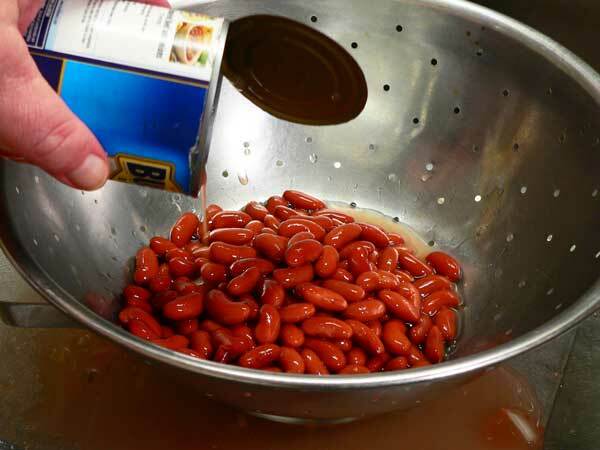 Empty the canned beans into a colander to drain off the liquid. Rinse the beans under cool running water, swishing them around to rinse them well. Let the beans drain really well. The drier the better. Any water left on the beans will make your finished salad “soupy,” so let the beans drain well while you prepare the other ingredients. I think next time, I might even spread some paper towels out on a sheet pan and spread the beans out to let them dry out even more so. I ended up with a bit more liquid in the bottom of the bowl after letting the salad sit for awhile than I wanted. Just an idea. Smile. 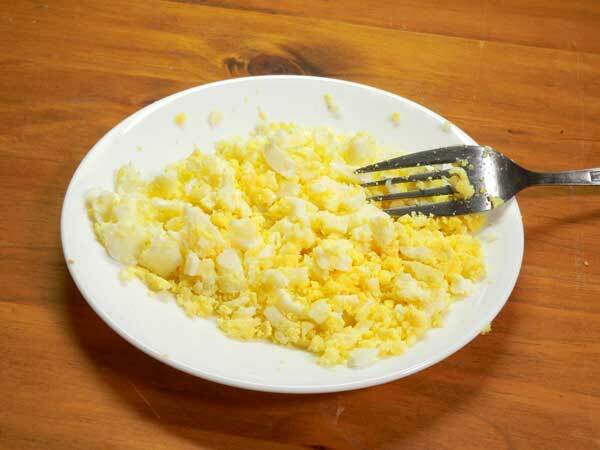 Use the back of a fork to break up the boiled eggs. 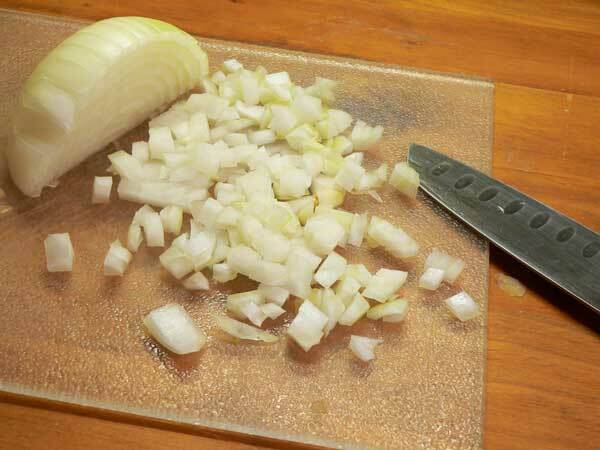 Dice the onions. The recipe calls for 1/2 cup so I didn’t use the entire onion that I had. 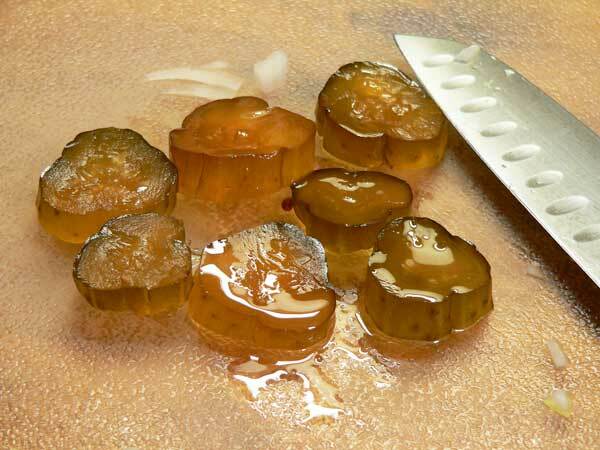 I’m going to chop up some of my own homemade sweet pickles made by Mama’s recipe. 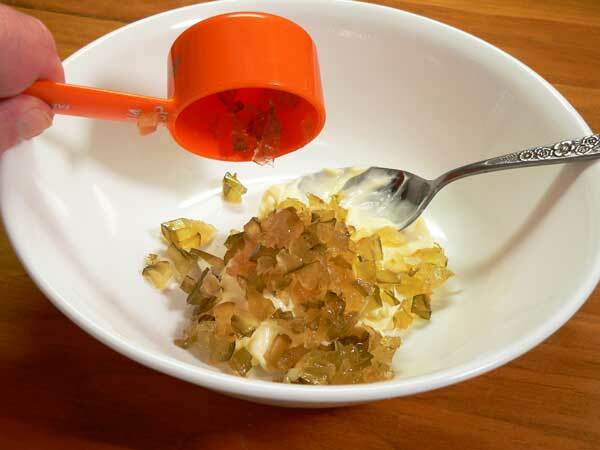 If you’re using a ready made relish, you’ll just need to measure out the required amount. 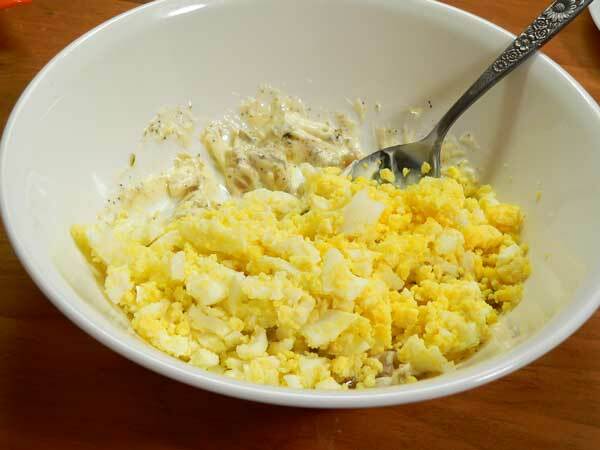 Grab a medium sized mixing bowl and add the Duke’s Mayonnaise to it. 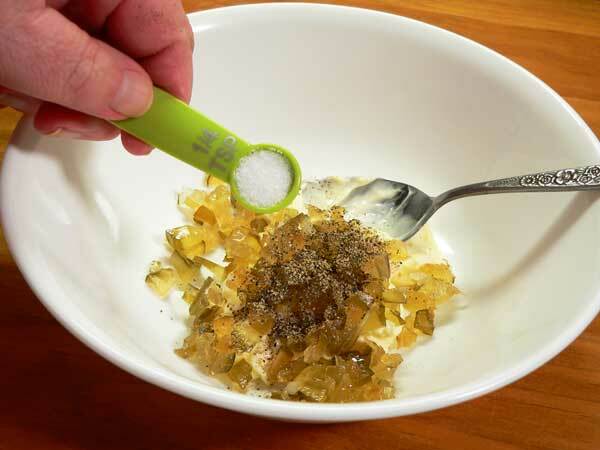 Sprinkle on the black pepper. Then add the salt. Go ahead and stir this up a bit. 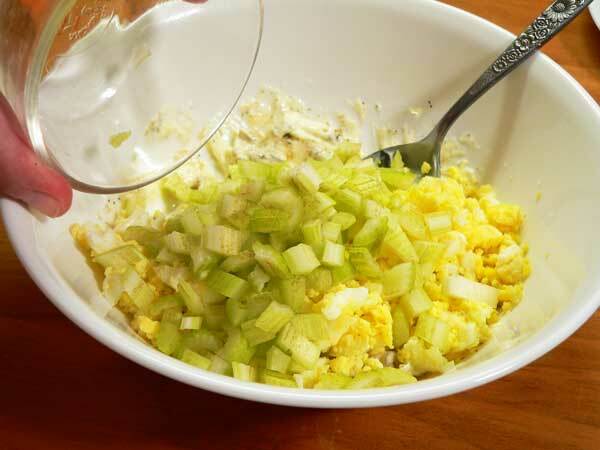 Now, add in the chopped eggs. Finally, add in the drained kidney beans. If you’ll notice, mine were still a bit wet even after sitting in the colander and draining while I prepared the other few items. Fold everything together until it’s fully combined. Cover the bowl with clear wrap and place it in the refrigerator. It needs at least a couple of hours for all the flavors to blend together, but it’s even better if you can refrigerate it overnight. This would have looked better if I’d placed it on some lettuce leaves, but I just didn’t have any on hand when I made the salad. I did try to spruce it up a bit with some slices of boiled eggs and a few extra pickles on the side. It may not be the most eye appealing dish, but I enjoyed the new taste. Kind of reminded me of a Waldorf Salad without the crunch of the apples. 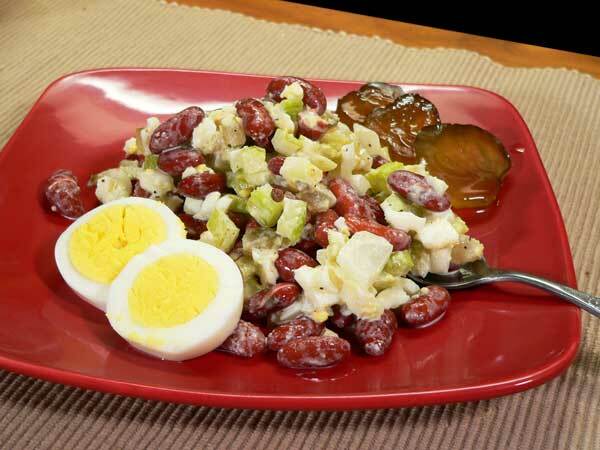 Follow our compete, step-by-step, photo illustrated instructions for making this old fashioned kidney bean salad recipe. 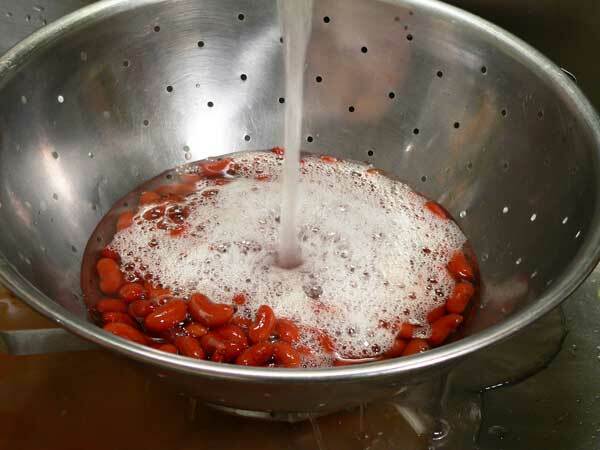 Drain kidney beans in a colander. Rinse and drain again. Let drain well. 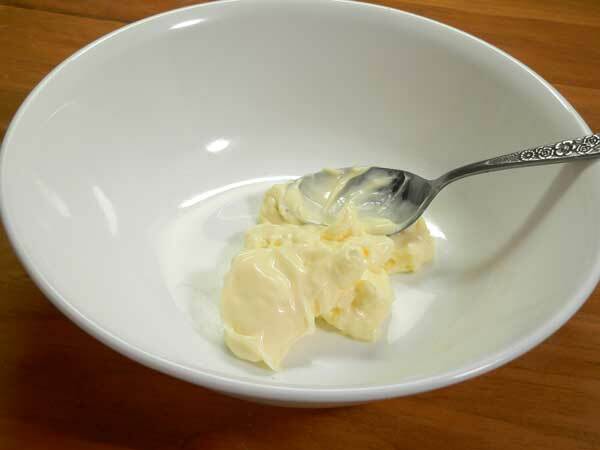 Place the mayonnaise in a medium sized mixing bowl. 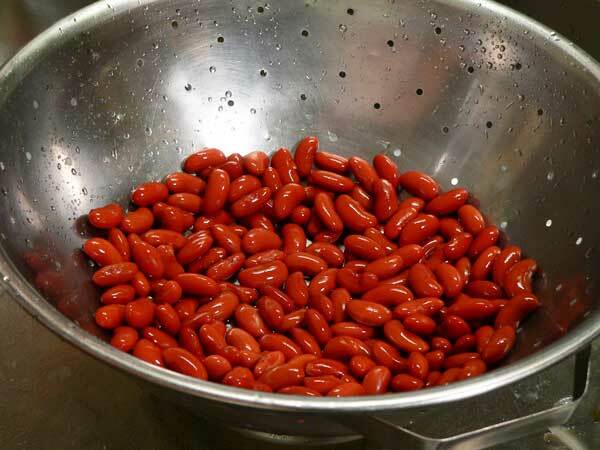 Add the drained kidney beans. 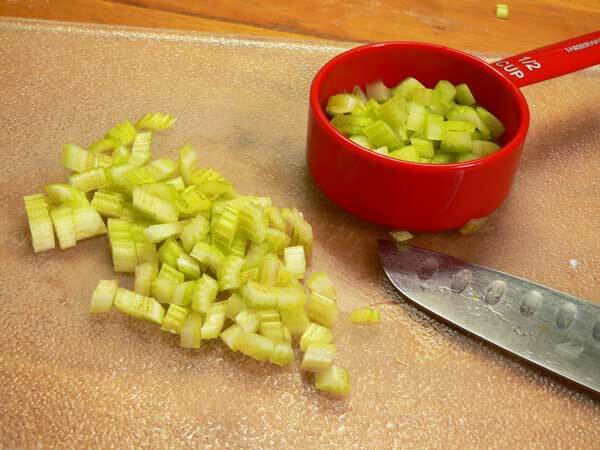 Refrigerate the salad for 1-2 hours, or overnight if possible, before serving. Some recipes call for dill pickles instead of sweet. I’m not a dill pickle fan so I opted to use the sweet pickle relish for this recipe. Other variations called for Italian Dressing as opposed to using Mayonnaise. Try it both ways to see which you like best. 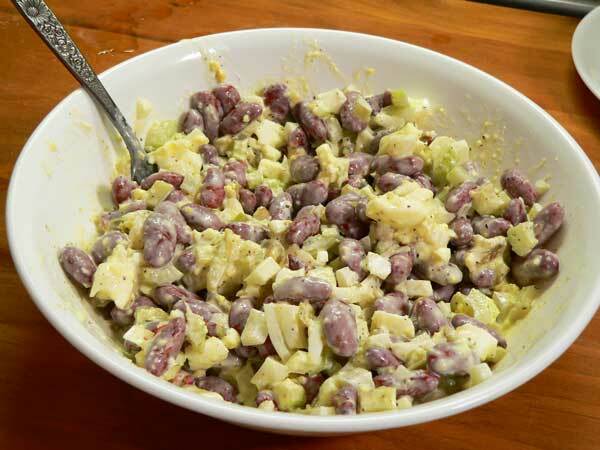 Ever had this old fashioned Kidney Bean Salad? Share your memories of this great Southern dish with us. Made Kidney Bean Salad Tuesday nite. First, I do not like kidney beans, nor do I eat celery unless it is cooked in a dish, never raw, and do not use DUKE’S MAYO in all of my salads. Just new salads. Did use sweet pickles I canned this summer. Now saying all that the bottom line is the Kidney Bean Salad is SOOOO–GOOD–. Had a bite just after making it last night, thought it was good, then put it in refrigerator. Took a bite this morning before breakfast to see how it tasted cold. Decided it was excellent and would make a good breakfast with my (not made from scratch) hot biscuit. One of the best breakfasts that I have had in a long time. Decided at lunch needed to see how salad tasted with crackers, just as good. Looks like this will become one of favorite salads. Last note I gave up on making biscuits about 40 years ago, sisters have tried to teach me, just has not worked. May get up enough nerve to try your recipe for biscuits, but then may not. Best wishes and remember time flies when you are having fun and Spring is just a short time away. Enjoy the Newsletter each week, first thing I read in the emails. My sister got this recipe from her mother-in-law. Being that her family was large she revised it to make it go farther. She doubled the recipe and added chopped tomatoes and mixed it all together with chopped lettuce. Topping it off with shredded cheese. She used dill pickles slices chopped up. This is fabulous for summer meals. 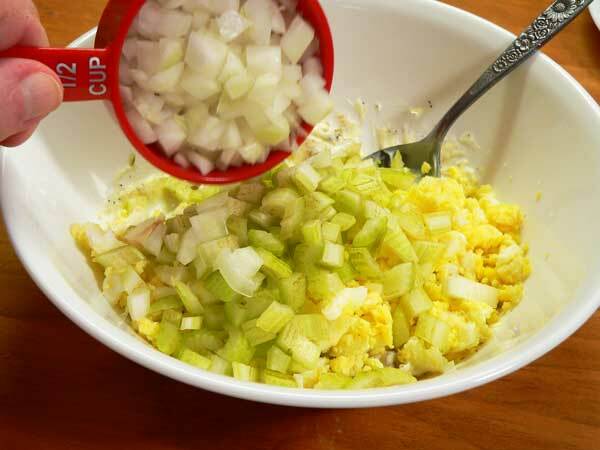 We make something very similar but sometimes add grated cheese and if we have it, diced ham. We make a kidney bean salad very much like this one.It has been afamily favorite for many years.We use 2 kinds of kidney beans,i can dark beans,one can light beans.We don’t use celery,but small amount vinegar and a small amount sugar.We also don’t drain the juice.Everyone likes the juice so well,you will catch them drinking it!! We also use the sweet pickles. Hi Steve. I love Monday morning when I get your newsletter and recipes!!! I did make the kidney bean salad this morning. It’s still fridging for tonight’s dinner. I have made similar but never with pickle relish. Taste test after 8 hours: delicious. I did, however, use only one egg as 2 seems to be way too much for only one can of kidney beans. The relish is a nice addition. Yes, I will make this again. Thank you, Steve. Can’t wait for next Monday!!!!! Just made this recipe for the first time, exactly as your recipe BUT, because we don’t have Duke’s mayo here, I used my regular brand. First taste went to my husband Don, who is my usual taste tester, he declared it to be excellent! I thought so too so can’t wait for it to mix and mingle for several hours in the fridge so we can enjoy it with supper. Thanks Steve, another winner! Not certain we can get Dukes Mayo in Canada, but I will look into it. If not, then we will just have to plan a a road trip from Vancouver BC Canada, to YOUR neck of the woods to get some! Always a pleasure reading your most welcome emails and recipes over breakfast every Monday Morning! You do make us smile each and eivery time. Be well, be happy and be excellent to everyone who is important to you. I grew up in a farm in Illinois, and we had kidney beans salad often. Thanks for reminding me of that tasty salad. We’ll be having it this week. I think it will go well with the barbecue ribs I’m fixing tomorrow. This was the first item I learned to make in high school cooking. That was 1966. I love kidney beans. Always a favorite we me. Not everyone a fan of the beans but my mother and myself loved it. They sell it at local stores by fresh salads but they want 4 to 6 dollars a pound. So I just make it my self. My mother used to make this as I was growing up in Southeastern Ohio. She had been born in Louisville, KY. I believe her mother made it there for the family. The only change that I remember was that she added left over roast beef that she cubed if we had any left from the night before. I,too had never heard of this salad, but since I have all of the ingredients on hand, I will be making this today. I plan to serve it with ham for dinner tonight. Thank you for a recipe that does sound a little strange,but something interesting. I do make several of your recipes,and find them tasty.